Join an event on Nomhop – get ready for a great social dining experience. It’s FREE! Nomhop enables exclusive home dining experiences for local and visiting food lovers in different places of the city. 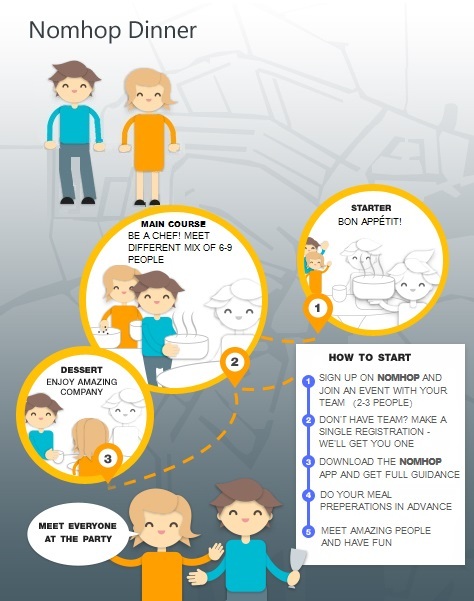 Register for the event – you can either do this as a team of friends, or you can register alone and Nomhop will team-up you to form a team of up to three members. Your team will cook one part of the meal (a starter, main course or dessert) at your kitchen or it might be kitchen of your team member. Other two parts of the meal will be served at the homes of two other teams as your team will be strolling around the city to get there. Therefore, during one event you will have a three course meal at three different places! The process is easy – just follow the messages on your Nomhop app. Once you have registered – the game is on, and you will receive all of the info from the Nomhop app on the go! Just before the event, Nomhop will notify your team of the location of the starter course. Once you have arrived, you will find two other teams, where one is the host that has prepared an amazing starter for you. In cases where your team is the one cooking the starter, you do not need to go anywhere; simply expect 4 to 6 guests (2 teams) to arrive at your place. Towards the end of your starter, the Nomhop app will notify you of the address for your main course, and you hit the road again. Once you arrive, you will meet a bunch of new people (two more teams), as nomhoppers mingle throughout the city. As you enjoy your main course, you will get a notification (like before) with the address of your next destination – the dessert. Finish your meal, and off you go again! It’s not only about good food, but also about meeting some amazing people. Part 3: Finish with a great dessert. Wait, there is more – an after-dinner party! At this point, you know pretty much everything about how it works – your team arrives at the dessert location and you meet two more amazing teams who will tell you the stories of their experiences strolling around the city with other nomhoppers. By the end of dessert, you may be realising what a surreal dining experience this was, and thinking that it will end now – but not really. You will receive yet another message, telling you where you can meet all of the other people you had dinner with to catch up on the evening’s stories, share your experiences and have some fun. After the event you will be offered the chance to leave feedback for your hosts on the Nomhop app. And yes, you will get some feedback yourself. Don't worry, the feedback can only be seen by you, so that you can improve your Nomhop score during the next event! Get connected with your local Nomhop community, or experience the city in a very different way while travelling. You can also initiate an event yourself! Find your event on our homepage and register now here. Want to learn more? Read Max's Nomhop event story here. A couple days prior to the event Max ans his team mate receives a notification from Nomhop with the details of the meal they will be preparing. This time they find that they will be cooking the main meal. That leaves them with plenty of time to decide what meal to prepare and to do the shopping. On the day of event Max and his team mate meets earlier so that they can start preparing their main meal. A couple hours prior to the start of the event they both receive notification from Nomhop with the address for starter. They arrive to discover that Oscar and Elsa been waiting for them there with some nice Spanish tapas for starter. Shortly Johan and Markus also arrive, they are the other team that are having starter at this address. Max doesn't know any of these people so they all introduce themselves, have a nice chat, help to prepare Veneziano and they enjoy starter together. Just as Max is finishing his starter he received an alter from Nomhop saying that his main meal will be at 23th Avenue, which in fact is Max’s home. Here his team will serve the main course. So they thank their hosts and new friends from the appetizer party and proceed back to their house. On arrival, Max's team finds that Maria and Daniel are already waiting at the door (that's why you should not be late!). Max invites them in and together, they start cooking traditional Swedish husmanskost. Soon, Lukas and Felicia arrive to join them. All together they finish cooking, enjoy the meal, have some wine and laugh at incredible jokes by Lukas. As Max is finishing the main dish he receives a message from nomhop saying that in one hour, his team needs to be at particular address for a desert. So they take the subway to that location to discover that two designers from Milan live there. And that amazingly looking tiramisù is for desert today! While Max is assisting them in serving the dessert, Sofia and Christian arrive to their desert venue with some great stories. While Max and his teammate is enjoying the international company and tiramisù, he receives the final message from Nomhop - address of the after party which appears to be a new trendy bar in the downtown. So after finishing their desert and drinks they alltogether proceed to the location where they find the people that he've met earlier in the evening as well as all the other participants. Everyone is sharing their impressions of the evening, discussing the dishes they had and enjoying some wine and beer.